The “AnchorVan” will offer free chicken (Champ Kind’s Whammy! 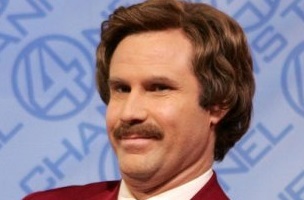 Chicken, of course) and give Ron Burgundy fans a chance to go on-camera to test their teleprompter reading skills. Following the launch at SXSW, “AnchorVan” will make stops in Chicago, Indianapolis, Cleveland, Pittsburgh, Philadelphia, Washington, D.C., Boston and ends its tour in New York City on April 1. Today is the day Anchorman 2 is available via early digital download and April 1 is DVD release date. God help us is there’s an Anchorman 3.